Thomas Cook shed a quarter of its stock market value on Tuesday after its third profit warning of the year caused shares to plunge. The company said it would take a £30 million hit to profits in an unscheduled announcement due to extra costs and the effect of the heatwave on holiday bookings. Underlying earnings will be £250 million for the year to September 30, down £58 million on 2017. This was put down to additional charges including flight disruption, writedowns on money owed by some hotels and transformation costs, as well as delayed demand for its tour holidays amid the heatwave. Group revenue was up 6% on a like-for-like basis, reaching £9.58 billion. Shares in the company plunged as much as 30% in early trading before settling at about 37p in mid-morning, a drop of more than 23%. 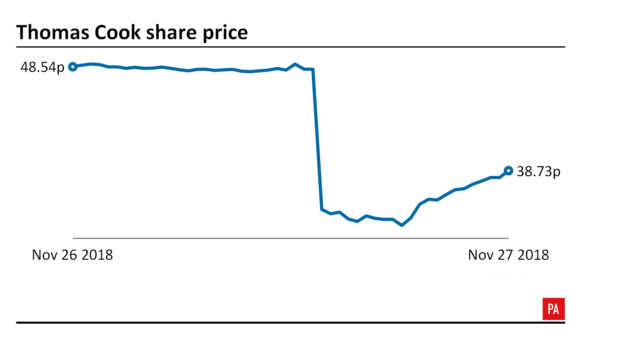 Rival holiday operator Tui was also affected, with shares dropping 3%. Earnings in the tour operator division dropped by £88 million due to a higher-than-anticipated decline in margins as Thomas Cook slashed prices to keep up with competitors. The company said the warm weather in Europe meant many customers had delayed holiday-booking decisions, with the UK particularly slow. Shareholders will not receive a full-year dividend. Chief executive Peter Fankhauser said: “Looking ahead, we must learn the lessons from 2018 and go into the new year focused on where we can make a difference to customers in our core holiday offering. Thomas Cook said it will focus on driving awareness and take-up of its own brands in the UK during 2019, as well as increasing its flexibility and reducing costs. Bookings for the forthcoming winter season are currently down 3% in the tour operator division, but airline bookings are 11% ahead of last year.